Just a few weeks away from Easter and we have to get terrible news that eggs, that dearly beloved symbol of Easter, have once again made the do-not-eat-too-many list. Our health advisors are saying not to consume more than 3 eggs a week! I need that many just to make a decent egg salad sandwich! There are those who cleverly get around the too much cholesterol argument by simply omitting the yolk, where all that fat (and dare I say flavor)lies. You can still crack an egg and eat it too but just the egg white, mind you. Somehow a paler than pale egg white omelet just doesn’t do it for me. I had big plans for the Easter Egg hunt this year, usually dyeing at least 6 dozen in pretty colors for the kids to find. I’ll have to re-think that one too. 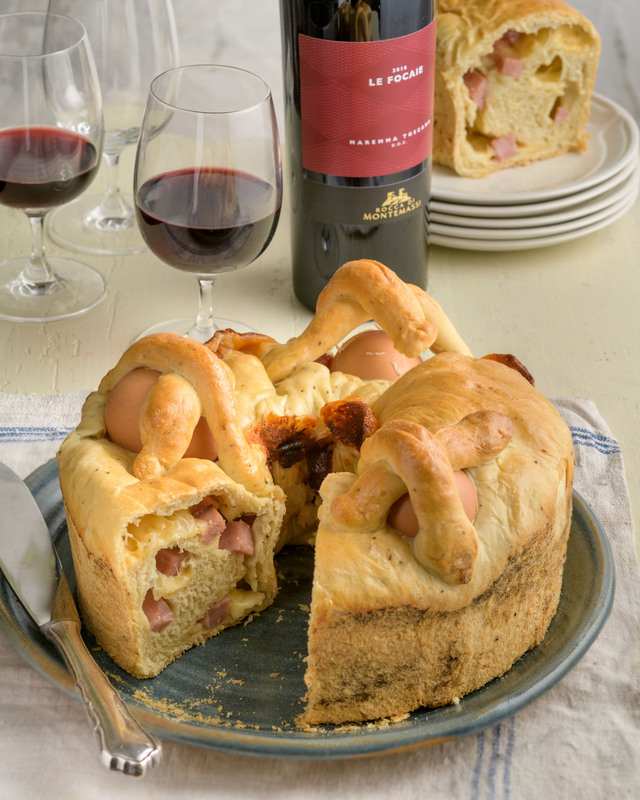 Can you imagine Italian Easter bread without the eggs popping out of the dough? Unthinkable. Sometimes you just need to listen to your inner voice and tune out everyone else trying to egg you on. Grease a 10-inch tube pan with a removable bottom and set aside. Dissolve the yeast in ½-cup warm water and allow it to proof and get foamy. Heap the flour on a work surface or add it to the work bowl of a stand mixer. Add the yeast, olive oil, salt and pepper and work it into the flour; add enough additional warm water to make a soft ball of dough. Cover and let it rise for 1-1/2 hours in a warm place, or until it doubles in size. Punch down the dough and break off a large orange size piece and set it aside. Knead the remaining dough for a few minutes and roll it out into a large 18 x 14-inch rectangle and scatter the cheese and salame over the surface to within 1-inch of the edges. Sprinkle with salt and pepper. Starting at the longest side, roll the dough up as for a jellyroll making sure to tuck in the ends and place it in the tube pan, seam side down. Bring the two ends together and fold under. Cover and allow to rise for about 1 hour or until the dough is 3/4 the way up the sides of the pan. Place three of the eggs randomly on the top of the dough, pressing them in to anchor them. Divide the saved piece of dough into 6 equal pieces and roll each piece into a 4-inch long length. Use two pieces to a make a cross over each egg. Beat the remaining egg with a fork and brush the surface of the dough. Bake for 45 minutes or until the bread is golden brown. Let cool on a rack then run a butter knife along the inside edges of the pan and loosen the bottom and remove it. Turn the bread out. Serve warm cut into wedges. I’m making this! It reminds me of Easter’s past, along with those little fried balls of dough stacked and covered in honey. I’m not making them 🤣! !